Blepharitis: Symptoms of blepharitis include burning, itching, oily discharge and flaky skin around the eyes. There are two main types – seborrheic and staphylococcal. Seborrheic involves a greasy discharge from the skin, especially around the eyes. Treatment involves keeping the skin clean, using mild soap, and for worse cases, the use of medicated pads. Staphylococcal is a bacterial infection which can cause styes. For this type of blepharitis, it is usually necessary to visit a professional and seek advice on what ointments you should use. Typically, antibiotics and sulfonamides are needed. If you have an infection of any kind, it is most often a good idea to seek help from an optometrist or other eye specialist. Conjunctivitis: Symptoms of conjunctivitis include scratchy, watery, and red eyes, red and sore eyelids, and blurry vision. There may also be a thicker discharge. 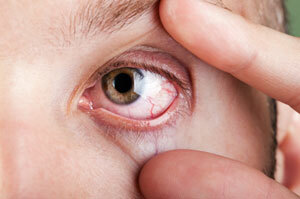 Conjunctivitis is commonly called “pink eye” and is often highly contagious. Conjunctivitis comes in three forms – allergic, chemical and infectious. They all have similar symptoms, but treatment may vary slightly. Allergic conjunctivitis can be caused by a reaction to cosmetics, pet dander, pollen, and other common allergens. The best way to treat this type is to simply avoid the triggers. Chemical conjunctivitis can come about due to exposure to certain chemicals, like chlorine in a swimming pool, or some kind of harmful fumes. Again, you should avoid the causes. For swimming, goggles can be worn. Eye drops may be needed as well. Infectious conjunctivitis is caused by bacteria or a virus. It is common among children, and it is important that you take the necessary measures to prevent spreading the condition, and a prescription will most often be required. Wash hands frequently, especially before and after using medicated eye drops, do not touch your eyes, do not share anything like towels or eye makeup. The eyes should also be treated as soon as possible to prevent spreading of the conjunctivitis. Dry eye: Dry eye is, as the name suggests, a condition in which the eyes do not produce enough tears. It can be due to the lower production of tears, or the deterioration of the quality of the tears. This can come about as a normal side effect of aging, or it can be caused by certain medications, health problems, or chemical burns. If left untreated, excessive dry eye can result in scarring of the cornea. First, the cause of the dry eye must be determined, so that the course of treatment can be decided. There are several tests that can eye health professionals figure out the problem. Generally, the most important treatment is to lubricate the eyes, usually via use of artificial tears. In worse cases, sufferers will need to use special ointment or even plugs that can block the eyelids from losing tears. After you have begun treatment, if problems persist or worsen, you must work with your optometrist to find a new course of action before further damage occurs. AMD (age-related macular degeneration): Age-related macular degeneration usually begins in people over 60. It is a fairly common condition, and it is irreversible. Blurry vision, seeing straight lines as wavy, and seeing dark spots are among the symptoms. There are two types of macular degeneration – atrophic or dry, and exudative or wet. Both affect the macula, which is the part of the retina that senses light. It is needed for seeing straight ahead, so peripheral vision is unaffected by AMD. Wet AMD is far more harmful, as it affects the new blood vessels, causing them to leak. This can eventually lead to a large blind spot for the sufferer. Dry AMD is more common and causes slower and less extensive vision issues. Many factors go into AMD, much like other age-related conditions, including degeneration of cells and overproduction of free radicals. The best defense is maintaining a healthy diet and avoiding smoking and exposure to UV light. There is no cure for AMD, but treatment can slow it down. Early treatment is especially important in wet AMD. New treatments are still being developed. Unfortunately, there is no treatment available for dry AMD. Glaucoma: Glaucoma is a condition that can often sneak up on a sufferer, and it most commonly affects those over age 40. There are few symptoms at its beginning, so getting tested regularly once you reach a certain age is important. The condition is caused by pressure building in the eye from excess aqueous fluid behind the front of the eye and affects the optic nerve. This nerve’s duty is to transmit images to the brain, and if it is not able to function properly, then peripheral vision suffers. The causes vary, from injuries to cataracts to infections, and people with diabetes and some other diseases can be at a higher risk for glaucoma. There are two kinds – primary open-angle, which may not be noticed until vision has gone downhill a great deal, and acute angle-closure, which first manifests with blurry vision and eye pain and redness. Glaucoma is a serious condition and can even eventually lead to blindness. There are several tests that professionals can perform to detect it, and eye drops and other medications can be used to treat it. In extreme cases, surgery may be needed. Once eye loss has occurred due to glaucoma, it cannot be recovered. This is why early detection is vital. Styes: Styes, also called hordeolum, are small, red, painful bumps on the eyelid, caused by a blocked gland that has been infected by bacteria. To treat a stye, a warm compress can be placed on the area several times per day. There are also ointments that can be prescribed, if necessary. The stye will come to a point, and it can then be squeezed in order to remove the pus. It is very important to clean the area after this process. If the stye is especially persistent, an eye care specialist may need to lance the stye to remove it. Diabetes-related eye problems: Diabetes is a serious condition that keeps the body from producing insulin, which is needed to break down sugar in the bloodstream. It affects nearly every part of the body, including the eyes. There are many symptoms that come about, including blurred vision, degeneration of peripheral vision, and visual disturbances such spots and floaters. Beyond these symptoms, diabetes may cause retinopathy, which includes weakening and swelling of blood vessels in the retina. This leads to leaking of blood and other problems that can eventually cause blindness. Retinopathy can be detected in an eye exam, and should be treated right away with laser therapy to keep it from worsening. If it has progressed too far, surgery may be needed. Early treatment will help prevent vision loss. Aside from diabetes, other contributing factors to retinopathy include smoking, excessive drinking of alcoholic beverages, high blood pressure, and being pregnant. Maintaining a healthy diet and having regular checkups can help prevent retinopathy.